Arlington County has put the final ARCA Neighborhood Conservation Plan on its website in its entirety, complete with appendices. The updated plan is the first in 39 years, and draws extensively from the results of the 2011 neighborhood survey. It describes new and ongoing activities and improvements that support our goals. Top concerns of individual homeowners are public safety, traffic controls and ease of transportation while preserving a quiet single family residential character. Recommendations are also made in Land Use, Zoning, Development and Housing, Parks and Recreation, Public Services and Infrastructure. The plan is the result of many hours of work by a dedicated group of neighbors under the able leadership of Natasha Pinol. The Neighborhood Conservation (NC) program has long helped pay for modest community improvements, like the current 23rd Street project of new curbs and gutters, but the County Manager is proposing slashing $24 million over the next 10 years from the program. NC has a lot of supporters throughout the County, but even they note that it can take years for projects to be completed. Board member John Vihstadt has his own concerns, but says that the program should be reformed, not ended. Others have suggested shifting its functions to the Dept. of Parks & Recreation, or using the “Complete Streets” program for funding. A final vote on NC funding by the County Board is scheduled on July 14, 2018. Our longtime volunteer group, “Friends of Hume School”, Chick Walter, Rich Kelly and Mary Morrison Silbert, with an army of willing neighbors, spearhead the semi-annual cleanups at the I-395 intersection and Hume School grounds. The morning starts off with breakfast and bagels, and finishes off with Rich Kelly’s signature hot dogs for lunch. The cleanups are in the spring and fall, and are supported by equipment from the County’s Parks and Recreation Department. For more information email Chick Walter at chickandsandy@msn.com. The project, installing curbs, gutters and a sidewalk on the north side of the street from Nash St. to Army Navy Drive, was nominated for NC funding by ARCA in October 2013. The County polled the affected residents and the project has been approved. It is now underway, five years later. A 2011 PEG funded the upgrade of this area, and now it now truly looks like a garden at the entrance to our neighborhood. In addition to the Little Bluestem, the county has planted a large number of sedum and several new crape myrtles. The triangle has been planted with liriope. If/when you have a few free minutes, stop by, pull a few weeds and enjoy this park-like setting. You’ll be glad you did!!! 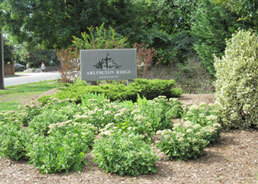 Many thanks to Patrick Wegeng and his team from the Parks and Natural Resources Division of Arlington County. If, like the rest of us, your garden is suffering from too much rain, too much heat, and attendant bugs and diseases, there are several places you can go for expert diagnosis. Arlington Central Library Plant Clinic is open from6.45 – 8.45pm every Wednesday; The Arlington Farmers’ Plant Clinic is open Saturday morning from 8 – 11am at N. 14th S. and N.Courthouse Road; the Del Ray Farmers Market Plant Clinic is located at 203 E. Oxford Ave., Alexandria from 8:30 – 11am on Saturdays, and the Alexandria Farmers Market Plant Clinic, 301 King St., Alexandria, is open from 7 – 9:30am on Saturdays. In addition,the Extension Master Gardener Help Desk operates year round from 9am – noon weekdays at 3308 S. Stafford Street, contact 703-228-6414. Looking for ways to make your yard more environmentally friendly? Apply for Arlington’s StormwaterWise program and the County will help you and you may even qualify for reimbursement. The program provides a financial incentive to remove pavement, install pervious driveways, rain gardens and conservation landscaping. These practices collect or slow down stormwater, allowing it to soak into the ground and keep pollutants out of Arlington’s streams. Single family homeowners, businesses and homeowners associations are eligible to apply. Arlington will select 60 applicants; participants who install one or more stormwater-reducing practices will be eligible for reimbursement of up to 50% of installation costs. Visit http://www.arlingtonva.us/stormwaterwise to learn more. It’s that time of year again – and many neighbors have plants that are obstructing sidewalks!! Under Arlington County Code, Chapter 10, Section 10-15 (Duty of Each Property Owner or Occupant of Property to Cut back Obstructing Vegetation) homeowners are responsible for ensuring that plantings or other structures on their properties do not encroach on public sidewalks. In considering whether sidewalks are clear, owners should consider two people walking abreast, a parent with a twin stroller, or a tall person with an umbrella, as well as driver’s sight lines as residents leave their driveways or enter intersections. The code states the entire width of the sidewalk, to a height of 10 feet, must be kept clear. What’s REALLY important is keeping our sidewalks clear so that our neighbors can safely and easily walk our neighborhood. Let’s each of us take a few minutes and check out our property – if the spring growth has resulted in bushes or trees getting too large, let’s spend a few minutes to trim them down to size! !